Praised for playing with “supreme melodic control and total authority” and “decided dramatic impact” (Calgary Herald), the Argus Quartet has quickly emerged as one of today’s most dynamic and versatile young ensembles, winning First Prize at both the 2017 Concert Artists Guild Victor Elmaleh Competition, and the 2017 M-Prize Chamber Arts Competition. The Argus Quartet’s busy 2018-19 season takes them to fifteen states across the country, featuring debut concerts in New York City at Weill Recital Hall at Carnegie Hall, Merkin Concert Hall and a return to Lincoln Center’s Alice Tully Hall. Additional season highlights include Chicago’s Dame Myra Hess Concert series, Washington Performing Arts (DC), UCLA’s Clark Memorial Library (CA). Krannert Center for the Performing Arts (IL), Purdue Convocations (IN), Kravis Center for the Performing Arts (FL), Chamber Music Society of Detroit (MI), Amherst College, and Juneau Jazz and Classics (AK). They began the season with two June 2018 performances at the Ravinia Festival, collaborating with legendary pianists Misha Dichter and Leon Fleischer, respectively. Argus is dedicated to reinvigorating the audience-performer relationship through innovative concerts and diverse programming. The Quartet’s core mission is to connect with and build up a community of engaged listeners, with the strong belief that today’s ensembles can honor the storied chamber music traditions of our past while forging a new path forward. In that spirit, the ensemble’s repertoire includes not just master works of the chamber music canon, but also a wide range of pieces by living composers. 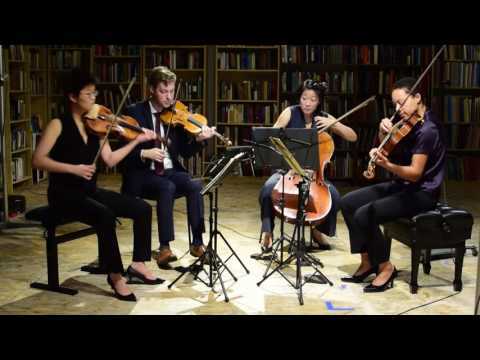 In the Fall of 2017, the Argus Quartet began a two-year appointment as the Juilliard Graduate Resident String Quartet, where they work closely with the Juilliard String Quartet. In addition, Juilliard presented Argus’ Lincoln Center recital debut at Alice Tully Hall in May 2018. From 2015-17 the Quartet served as the Fellowship Quartet in Residence at the Yale School of Music (as the ﬁrst ensemble mentored by the Brentano String Quartet in that capacity), and during the 2016-17 season, they served as the Ernst Stiefel Quartet in Residence at the Caramoor Center for Music and the Arts. As passionate advocates for the music of our time, Argus served as the Quartet in Residence at New Music on the Point under the guidance of the JACK Quartet, and was also selected as one of three ensembles to perform works from Kronos Quartet’s “Fifty for the Future” commissioning project at Carnegie Hall. Recent commissions include new quartets by Donald Crockett, composer and GRAMMY nominee Eric Guinivan, the 2014 Hermitage Prize winner Thomas Kotcheff, and Guggenheim Fellowship recipient Juri Seo. The Quartet has received grants from Chamber Music America and the Caramoor Center for Music and the Arts in support of their commissioning efforts, and have also performed works by some of today’s most important composers: Augusta Read Thomas, Garth Knox, Jason Eckardt, Christopher Theofanidis, Martin Bresnick, Andrew Norman, and many others. 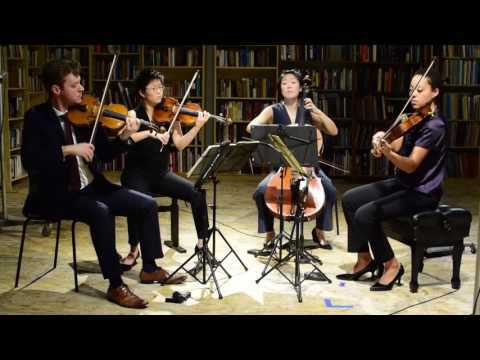 Founded in Los Angeles in 2013, the Argus Quartet has performed at a number of leading music festivals, including the Ravinia Steans Music Institute, Norfolk Chamber Music Festival, Birdfoot Festival, the Albany Symphony’s American Music Festival, Cello Biënnale Amsterdam, Bang on a Can at the Noguchi Museum, the Hear Now Music Festival, and Music Academy of the West. Education and outreach are an important part of the Argus Quartet’s mission. The quartet has worked with students through residencies and masterclasses at the Yale University, James Madison University, Rockport Music, the Milken School, the Young Musicians Foundation, California State University Long Beach, Los Angeles City College, and Princeton University. ...superb recital by the Argus Quartet...done with magnificent assurance.